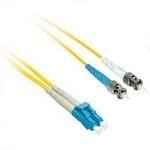 Get the performance you demand at a price that makes sense with 9/125 Single-Mode fibre patch cables from Cables To Go. Perfect for high bandwidth applications requiring high transmission rates over longer distances. These cables are a cost-effective solution for use with today's high speed networks and provide flexibility to grow with tomorrow's higher bandwidth requirements.